Be the first to share your favorite memory, photo or story of Robyn Lynn. This memorial page is dedicated for family, friends and future generations to celebrate the life of their loved one. 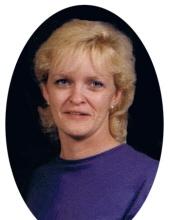 Robyn Lynn Bryant Hayes, age 61, of Elm Tree Lane, Lexington, formerly of Morehead, passed away Saturday, February 2, 2019, at her residence. Born December 12, 1957, in Rowan County, she was a daughter of the late Wayne Bryant and Helen Fern Plank Bryant Kiser. Robyn is survived by one son, Jamie Cooper (Angela) of Olive Hill; two daughters, Kelly Stevens of Morehead and Angela Boaz of Lexington; and 11 grandchildren. Also surviving are three brothers, Jerry Bryant of North Carolina, Tim Bryant (Pamela Barron) of Mt. Sterling, and David Bryant of Louisville; one sister, Melissa Manley (James) of Owingsville; and several nieces nephews. Robyn was a homemaker and enjoyed watching U.K. basketball. Graveside services will be conducted 1 p.m. Wednesday, February 6, 2019, at Adams-Plank Cemetery with Pastor Lowell Rice officiating. At Robyn’s request, there will be no visitation. Arrangements are under the direction of Northcutt & Son Home for Funerals, Morehead, Kentucky. To send flowers or a remembrance gift to the family of Robyn Lynn Bryant Hayes, please visit our Tribute Store. "Email Address" would like to share the life celebration of Robyn Lynn Bryant Hayes. Click on the "link" to go to share a favorite memory or leave a condolence message for the family.